The factory racing team will officially be known as Suzuki Ecstar for their return to MotoGP when the season starts in Qatar. Suzuki announced the partnership with Ecstar, the Japanese manufacturers own brand of engine oil, at the official team launch this morning along with unveiling their new livery. 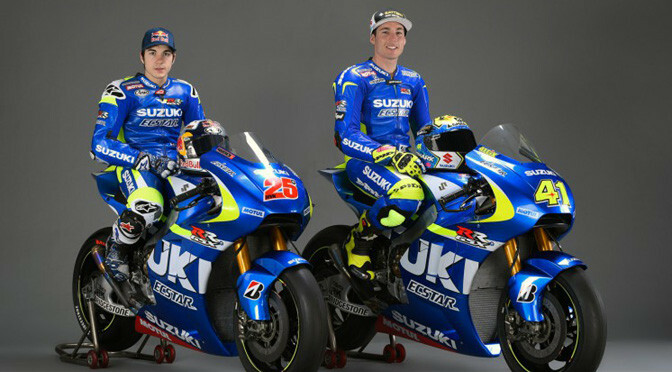 Aleix Espargaro, who finished seventh overall in the premier class last year, will be joined by 2013 Moto3™ Champion Maverick Viñales onboard the newly developed GSX-RR as Suzuki make their return to the top tier of motorcycle racing.